A vaccine is a substance made of weakened or killed disease germs designed to make a body immune to (safe against) that particular infectious disease. Effective vaccines change the immune system (the body's natural defense system against disease and infection) so it acts as if it has already developed a disease. The vaccine prepares the immune system and its antibodies (disease-fighting chemicals) to react quickly and effectively when threatened by disease in the future. The development of vaccines against diseases ranging from polio to smallpox is considered among the great accomplishments of medical science. 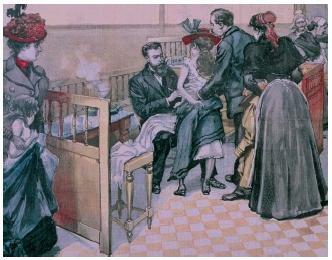 The first effective vaccine was developed against smallpox, a fast-spreading disease characterized by high fever and sores on the skin that killed many of its victims and left others permanently disfigured. The disease was so common in ancient China that newborns were not named until they survived the disease. The development of the vaccine (which was injected with a needle) in the late 1700s followed centuries of innovative efforts to fight smallpox. English physician Edward Jenner (1749–1823) observed that people who were in contact with cows did not develop smallpox. Instead, they developed cowpox, an illness similar to smallpox but one that was not a threat to human life. In 1796, Jenner injected a healthy eight-year-old boy with cowpox. The boy became moderately ill, but soon recovered. Jenner then injected the boy twice with the smallpox virus, and the boy did not get sick. Jenner discovered that exposure to the cowpox virus spurred the boy's immune system. The cowpox antigen stimulated the production of antibodies specific to that disease. (An antigen is a substance that stimulates the production of an antibody when introduced into the body.) The antigen conditioned the immune system to move faster and more efficiently against smallpox in the future. Jenner called the procedure vaccination, from the Latin word vaccinus, meaning "of cows." In 1979, world health authorities declared the eradication of smallpox, the only infectious disease to be completely eliminated. Antibody: A molecule in the immune system that is created to destroy foreign molecules in the body. Antigen: A substance such as a bacterial cell that stimulates the production of an antibody when introduced into the body. Epidemic: Rapidly spreading outbreak of a contagious disease. Immune system: The body's natural defense system that guards against foreign invaders and that includes lymphocytes and antibodies. Infectious: A type of disease that is spread primarily through contact with someone who already has the disease. While the viruses that cause poliomyelitis (more commonly known as polio) appear to have been present for centuries, the disease emerged with a vengeance in the early 1900s. Polio wastes away the skeletal muscles and thus brings about paralysis and often permanent disability and deformity. At the peak of the epidemic, in 1952, polio killed 3,000 Americans and 58,000 new cases of polio were reported. In 1955, American microbiologist Jonas Salk (1914–1995) created a vaccine for polio. When the vaccine was declared safe after massive testing with schoolchildren, the vaccine and its creator were celebrated. The Salk vaccine contained the killed versions of the three types of polio virus that had been identified in the 1940s. In 1961, an oral polio vaccine developed by Russian-born American virologist Albert Sabin (1906–1993) was licensed in the United States. The Sabin vaccine, which used weakened, live polio virus, quickly overtook the Salk vaccine in popularity in the United States. Because it is taken by mouth, the Sabin vaccine is more convenient and less expensive to administer than the Salk vaccine. It is currently administered to all healthy children. In the early 1990s, health organizations reported that polio was close to extinction in the Western Hemisphere. diseases. Other vaccinations are used only by people who are at risk for a disease, who are exposed to a disease, or who are traveling to an area where a disease is common. These include vaccinations for influenza, yellow fever, typhoid, cholera, and hepatitis A. Internationally, the challenge of vaccinating large numbers of people is immense. Although more than 80 percent of the world's children were immunized by 1990, no new vaccines have been introduced extensively since then. More than 4 million people, mostly children, die needlessly every year from preventable diseases. Worldwide each year, measles kills 1.1 million children, whooping cough kills 350,000, tetanus kills 500,000, and yellow fever kills 30,000. Another 8 million people each year die from diseases for which vaccines are still being developed. While some researchers seek new vaccines, others continue to look for ways to distribute existing vaccines to those in desperate need.